The Marlin is the scatter icon and can multiply your wins, the Golden reel is the wild icon and can replace others for a perfect win and 5 Propeller icons activate the bonus game. Hook some fine rewards with the Reel Strike video slot game where you can wager up to 10 per pay-line for a single spin. 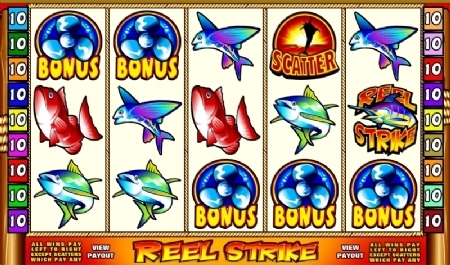 You will find various kinds of fish as icons on the reels and there is a free spin feature as well as scatter and wild icons that makes winning a lot of fun. There are 15 pay-lines across 5 reels that will improve your winning chances if all of these are activated.